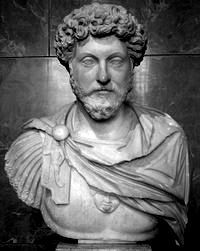 The emperor from 161 to 180 was Marcus Aurelius, a student of philosophy, religion and morality. He wanted to do right by the empire and to improve the world. He defended the empire against military offensives by the Parthians and incursions by Germans. He was one of those who would be labeled a good emperor – a reminder to some that the saying "power corrupts and absolute power corrupts absolutely" is one of those sayings that sounds profound but is false sociology. Nevertheless, Aurelius made his contribution to Rome's failings. Staying with the passing of power from father to son, he had his son Commodus succeed him, which began Rome on a path of ruin. Commodus was not the hard worker and self-denying soldier that his father had been. He managed governmental affairs poorly, including selling government offices to the highest bidder. He was a disappointment to Romans. He disliked anyone who reminded him of his failure to live up to his father's moral standards or who reminded him that in his youth he had tried to pursue virtue. Like Nero, he tried to win popularity in public performances. He entered the arena, wearing animal skins or elaborate costumes that many thought too feminine. There he stabbed or clubbed animals to death to the applause of the crowd, while many who were not applauding thought that he was demeaning his position as emperor. The Son of Severus, Emperor Caracalla, had some citizens of Alexandria slaughtered because they had ridiculed him – not the kind of thing that happens in a democracy. 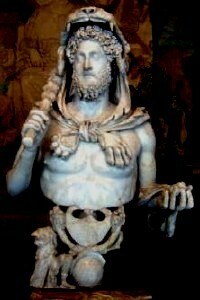 Commodus allowed his Guard in Rome and soldiers elsewhere to be abusive toward civilians. Concerned about opposition from military governors, he had their children cared for under his custody – in effect hostages. He had an enemies list of those he planned to execute, but others got to him first. He was assassinated twelve years after having succeeded his father. The Senate then chose one of their own as emperor, Pertinex, who was assassinated after eighty-seven days. 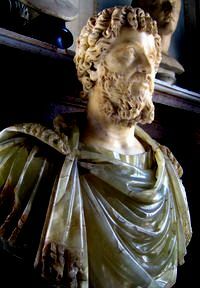 Another Senator, Julianus, bribed his way to a Senate declaration as emperor. Whenever Emperor Julianus appeared in public the Romans jeered him. When news of what was happening in Rome reached the military-governors in the provinces, a number of them became interested in replacing Julianus, and four years of civil war between rival military commanders followed. The victorious commander was Septimius Severus. Like some other military commanders, he had been born outside Italy – in what today is Libya. He had spent most of his career in the provinces and had no sense of the people of Rome as privileged above others in the empire. Rome, in fact, was being swallowed by its empire. Severus deprived Rome's aristocracy of its traditional places in the city government of Rome and in the military. Severus was followed by his son, Emperor Caracalla, who had murdered for power by killing his brother – in front of their mother. Caracalla extended citizenship to all free persons within the empire, further submerging Rome within the empire. Caracalla was assassinated while urinating. He was followed by Severan family weaklings. One was Elagabulus in 218, emperor from age fourteen. Elagabulus was assassinated a little less than four years later in a plot formulated by his grandmother, Julia Maesa, and carried out by the Praetorian Guard. This made Elagabulus' cousin, Alexander Serverus, age 13, emperor. And he remained emperor until he was 26, with his mother continuing as his advisor. In the year 235, while in his tent during a military campaign, he was assassinated by military officers and he died cringing and crying in his mother's arms. The new soldier-emperor, Maximinus, was not from Rome. He was the son of Thracian peasants – a German and an Alan. He had little respect for what remained of Rome's institutions. He was the first emperor who did not win or seek Senate confirmation of his rule. He was never to set foot in Rome. But the senators, afraid for their safety, were only silently antagonistic toward him. Maximinus doubled the pay of his soldiers, and he upset Rome's civilians by giving money to the army that had been slated for welfare. Farmers in North Africa grew disturbed over Maximinus' high taxes, and they began to create disturbances. Romans in various parts of the empire saw Maximinus as a barbarian foreigner pretending to be an emperor. In Rome, angry packs of men hunted down and murdered his supporters. An army of North Africans, members of the Praetorian Guard, some senators, and some who saw themselves as the Romans of Old, went north from Rome to battle against Maximinus. They managed to isolate him and a some of his soldiers. To buy their safety, these soldiers killed Maximinus and his son. The political chaos, meanwhile, produced a decline in respect for authority, caused in part by armies on the move within the empire, plundering towns and farms. Military-emperors sent tax collectors about the empire forcing more taxes on people. During the first half of the 200s, taxation encouraged men of commerce to hoard their money rather than invest it. To pay soldiers, emperors debased money. Prices skyrocketed. The empire's middle class went bankrupt, and roads deteriorated. More people had become beggars, and many others feared that they too would soon be impoverished. In Rome and other big cities, proletarians remained disinclined to organize themselves against authority, but here and there in the countryside desperate peasants did revolt, but their uprisings were not coordinated and not widespread enough to challenge the empire militarily. In various parts of the empire, bands of desperate people wandered the countryside, surviving by theft. In 235 bands of brigands had swept through Italy. In Gaul, hordes of people roamed about, pillaging as they went. Piracy grew on the Aegean Sea, and tribal people from the Sahara attacked Roman cities along the coast of North Africa. Disorders sometimes cut off trade routes. By 250, Rome's trade with China and India had ended. Agricultural lands in the empire were going unused. With the declining economy, people moved from cities and towns to rural areas in search of food. Cities began shrinking to a fraction of their former size, some to be occupied only by administrators. Where agricultural estates felt threatened by barbarian or Roman soldiers they protected themselves by fortification, and their neighbors surrendered their holdings to them in exchange for protection. Economic relations were developing that would last into the Middle Ages. The kind of governance put in place by Rome's revered Augustus as an alternative to democracy and the chaos he wanted to avoid, had failed.